Home Tips & Tricks The Best Cleaner for Easyboots: Dawn or Simple Green? 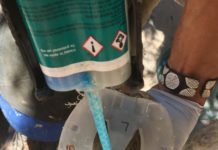 The Best Cleaner for Easyboots: Dawn or Simple Green? 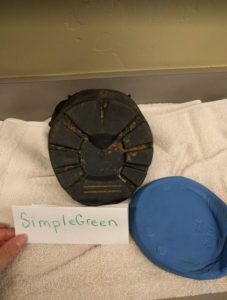 Here at EasyCare, we get a lot of phone calls and emails from people asking us what we recommend for cleaning Easyboots. 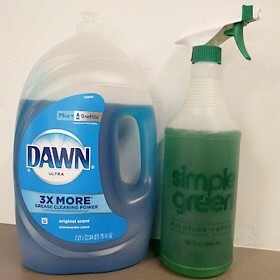 In this article, I’m sharing the results of a head-to-head test using our top 2 favorite cleaners – Dawn dish soap and Simple Green. And yes, both are safe to use around animals! You can see we’re attempting to clean a pair of very muddy, “well-loved” Cloud boots (the white stuff is baby powder used to keep the hoof dry). Our cleaning procedure was simple. 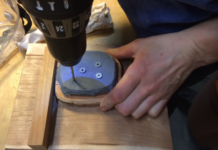 We wet the boot with warm water before applying the cleaner. Simple Green, being a spray-on, is the easiest. For Dawn, we put a generous amount of soap on the scrub brush. We reapplied cleaner and scrubbed a couple of times as needed before rinsing the cleaner off the boot. To clean the treads, we used a hoof pick while holding the boot under warm, running water. 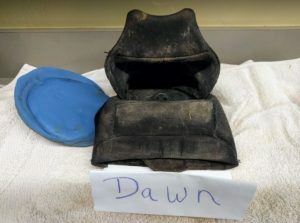 We washed the first boot with Dawn dish soap. It took about 10 minutes and a lot of elbow grease, but the boot turned out pretty clean. The base of the boot is shiny and new looking, however the inside didn’t get as clean as we had expected. 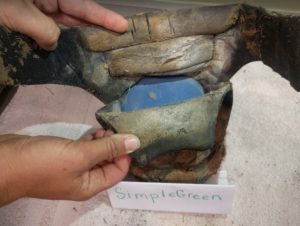 Next, we used Simple Green on the other dirty boot. We spent about 10 minutes scrubbing this boot, too. 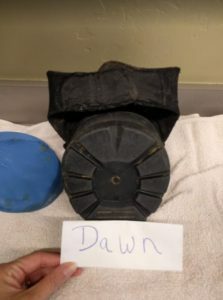 After the two boots dried, the Product Specialist Team agreed that Dawn did a better job of cleaning the urethane base, but we liked what Simple Green did to the inside of the boot. It turned out much cleaner. 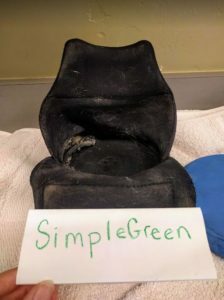 If we had to pick a winner, we would go with Simple Green because we think it’s more important for the inside of the boot to be clean. 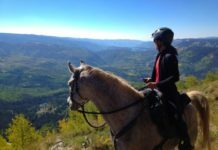 After all that’s where your horse’s bare hoof is going. But if you want a pony-club finish than use Dawn. Or better yet, use a combination of Simple Green on the inside and Dawn on the outside. It’s always a good idea to keep the inside of the boot clean, but you don’t need to wash it like this every day. Just use a hard, scrubby brush and do a deeper cleaning once a week or as needed. To maintain the longevity of the boot, we recommend that you keep the boot out of direct sunlight until it’s thoroughly dry.